If you were to do a search for the Nairobi city slum of Mathare on, you'd find little more than gray spaces between unmarked roads. 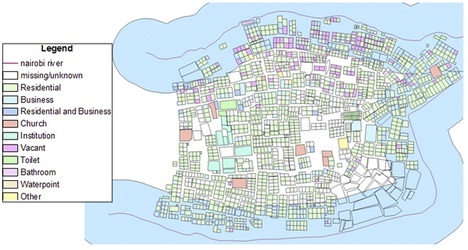 Slums by nature are unplanned, primordial cities, the opposite of well-ordered city grids. Squatters rights rule, and woe to the visitor who ventures in without permission. But last year, a group of activist cartographers called the started walking around Mathare typing landmarks into hand-held GPS devices. In a slum with no addresses and no street names, they are creating a map of what it's like to live here. Their map includes things like informal schools, storefront churches and day care centers, but also dark corners with no streetlights, illegal dumping grounds and broken manholes. They bring the most urgent problems to the attention of the authorities. Slum mapper Isaac Mutisya, whom everyone calls Kaka, says they have actually been able to get a few streetlights built. And it's always the map that makes the difference. "Because it's technology, it can shame some of the people," he says. "Like, 'Why didn't you put up a light there when we told you that this area is dangerous?' "
We think of GPS maps as guides. They are the sometimes annoying, always calm, recorded voice in our car that steers us through unfamiliar places. But maps are also public records that can help slum dwellers negotiate with city authorities. The slum-mapping movement started in India about a decade ago and more recently migrated to Africa. The idea is to make slums a reality for people who would never set foot in one. A map can be entered as evidence in court to stop evictions. It can be reprinted by international advocacy groups to raise awareness. It can be presented to city planners, as a puzzle to be solved. Emily Wangari is a member of . She invites me into her one-room house. Pigeons dance on her roof — an entrepreneurial side project of her neighbor's son — and send tremors through Wangari's only light bulb. To picture the astonishing map she unfolds on her lap, imagine a satellite photo of your hometown and trace lines around all the houses and buildings: What you'd get on the tracing paper would be squares and rectangles surrounded by space — the space being the lawns and parks and roads. But Wangari's map looks more like a mad game of Tetris. Blocks of every shape are jammed in together with no space between, except narrow pathways following the trails of open sewers. And every year these narrow streets get narrower still, as people expand their houses farther into the walkway. "People take that as an advantage of just widening their house," she says. If there's any extra public space, people take it for their own. If Kaka's map, the Spatial Collective map, is a map of city neglect, Wangari's map describes life in a slum where the idea of public space has no enforceable authority. You'll find no parks, no playgrounds, no breathing room. This year Wangari did use her map to briefly claim some communal space. The story is this: After years of grass-roots activism, the city of Nairobi finally agreed to pipe in municipal water and sell it at public collection points for a half a penny on the gallon. But when the city workers went to lay the pipes, the place was so crowded they couldn't actually find enough space for their shovels. So Wangari had to go around telling people to move parts of their houses. But then she pulled out her map, showed people where their houses were and assured them they could get their space back. "We had to tell people, 'Move your structure a bit so the [water] line can pass. But you are assured, of building back. Yeah, when the line passes you'll build back,' " she says. It's the kind of guarantee that never gets granted in this slum. Amazingly, people accepted. The water line was laid. It was as if in a place where no one has a legal right to anything and everything is claimed by force, the map provided some assurance — if not of actual ownership, then at least of a shared record of the past that allowed people to plan together for the future. In the storage room of an Internet cafe that the Spatial Collective uses for its office, I watch Kaka and the other slum mappers play idly with their GPS devices. In nine clicks, they zoom out the view broader and broader to encompass Nairobi city, then Kenya, then Africa, then the globe. Kaka laughs when I point out his habit. While basic inadequacies and deep uncertainty still define the life here, he says, the days when some unscrupulous developer could send arsonists in at night and erase all traces of a community seem to be fading into the past. Among residents, there's a growing sense that in seeing their slum from the satellite level, from 10,000 miles up, they are starting to take their city out of the shadows.